These beautiful chakra energy centers fabric decals come in a set of 7 circular decals. This set includes the root chakra, throat chakra, solar plexus chakra, crown chakra, sacral chakra, third eye chakra, and heart chakra. 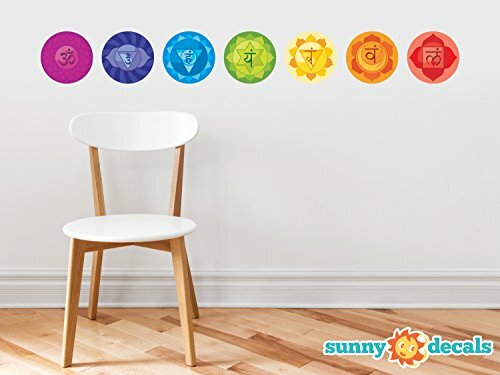 These spiritual wall stickers are perfect for your yoga studio, home, or meditation room. The decals are made from a high quality fabric material that is non toxic and easy to apply. REMOVABLE AND REUSABLE - Will pull apart if it turns in and sticks to itself and will not easily tear. Repositionable and reusable many times over. If you have any questions about this product by Sunny Decals, contact us by completing and submitting the form below. If you are looking for a specif part number, please include it with your message.